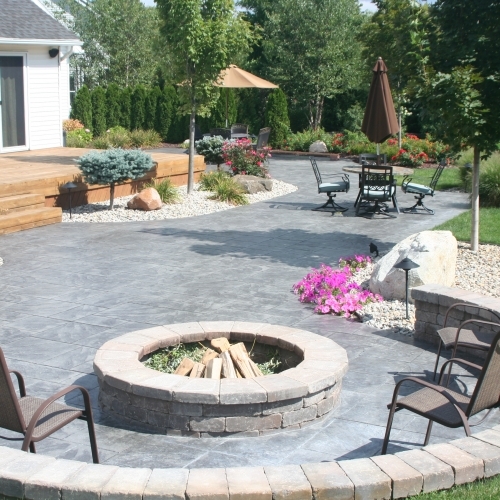 There are many ways that you can use stamped concrete to improve your property in South Lyon, MI. We have used it for local homes in building patios, driveways, walkways, pool decks and more. Our landscaping team has many years of experience in designing and installing these projects and we are always making sure to use the best products that are available in the industry. We continually hold ourselves to the highest standards possible and we are always looking to figure out ways to better satisfy our customers. We are always looking forward to the opportunity to work with a new customer. Check out some of the photos below to get a sense of what kind of stamped concrete work we have been doing for homes around South Lyon for decades. If you already have a decent idea of what you would like us to install, feel free to request a quote online today. If not, give us a call and one of our professional staff members will be happy to discuss all of your options with you.